In tan brown with minimal branding, these leather lace-ups from Officine Creative are a dapper way to lend character to conservative suiting or to up the ante of classic denim. From the brogue detailing to the leather soles - they are perfect for work or casual. 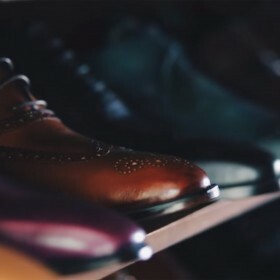 Every man needs a pair of classy shoes, and men’s brogues are a wonderful choice! These shoes are so popular because they are very simply styled with the rest of your wardrobe. If you’re looking for a casual look, try a pair of straight leg jeans, a patterned short sleeved t-shirt and a pair of bright brogues. Men’s brogues also fit well with a pair of fitted pants and a white long sleeve shirt with a waistcoat for the office. There are loads of possibilities to discover, so go ahead and find your pair.